Characteristic: Cool nights and a constant, fresh breeze characterize this sunny vineyards. Situated over 500 m above sea level, they allow the compact bunches of Pinot Grigio grapes to mature and develop their full aroma. The brilliant straw-yellow color is tinged with light green; the aromas vary quince to pears to toasted almonds. On the palate, the wine is full-bodied and racy, with a round and harmonious finish, thanks to aging in barriques. Recommendation: This wine is an excellent accompaniment to mushroom dishes, fish and seafood. It is also recommended as an aperitif wine. "Wine & Spirits Magazine" has rated the wine "Kellerei Kaltern Soll Sudtiroler Pinot Grigio, Alto Adige, Italy" the vintage 2015 on 01.10.2016 with 88 of 100 points. "Wine Enthusiast" has rated the wine "Kellerei Kaltern Soll Sudtiroler Pinot Grigio, Alto Adige, Italy" the vintage 2014 on 04.01.2016 with 89 of 100 points. "Wine Enthusiast" has rated the wine "Kellerei Kaltern Soll Sudtiroler Pinot Grigio, Alto Adige, Italy" the vintage 2012 on 06.01.2014 with 90 of 100 points. "Wine & Spirits Magazine" has rated the wine "Kellerei Kaltern Soll Sudtiroler Pinot Grigio, Alto Adige, Italy" the vintage 2011 on 01.08.2013 with 90 of 100 points. 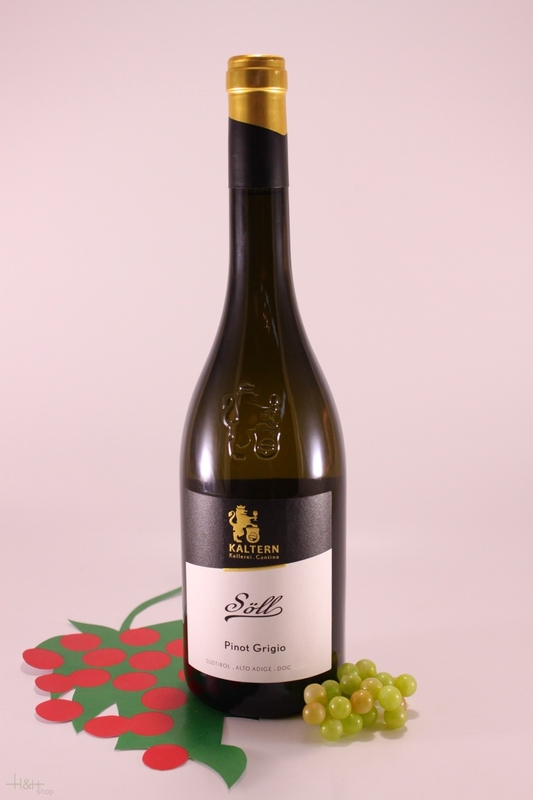 "Wine & Spirits Magazine" has rated the wine "Kellerei Kaltern Soll Sudtiroler Pinot Grigio, Alto Adige, Italy" the vintage 2008 on 01.08.2010 with 91 of 100 points. "Wine Enthusiast" has rated the wine "Kellerei Kaltern Soll Sudtiroler Pinot Grigio, Alto Adige, Italy" the vintage 2009 on 11.01.2010 with 89 of 100 points. 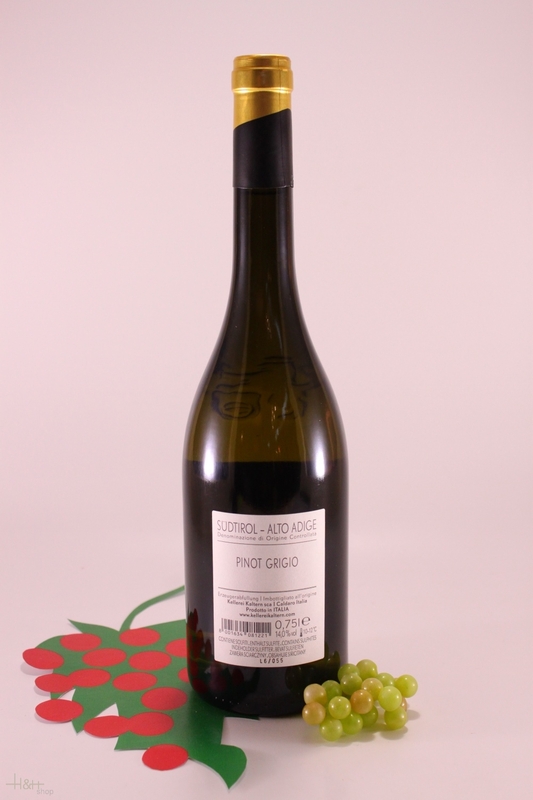 "Wine Spectator" has rated the wine "Kellerei Kaltern Soll Sudtiroler Pinot Grigio, Alto Adige, Italy" the vintage 2007 on 28.02.2009 with 91 of 100 points. "Wine Spectator" has rated the wine "Kellerei Kaltern Soll Sudtiroler Pinot Grigio, Alto Adige, Italy" the vintage 2006 on 15.11.2007 with 87 of 100 points. "Wine Spectator" has rated the wine "Kellerei Kaltern Soll Sudtiroler Pinot Grigio, Alto Adige, Italy" the vintage 2005 on 15.11.2006 with 88 of 100 points. "Wine Spectator" has rated the wine "Kellerei Kaltern Soll Sudtiroler Pinot Grigio, Alto Adige, Italy" the vintage 2004 on 15.05.2006 with 87 of 100 points. "Wine Enthusiast" has rated the wine "Kellerei Kaltern Soll Sudtiroler Pinot Grigio, Alto Adige, Italy" the vintage 2004 on 02.01.2006 with 86 of 100 points. "Wine Spectator" has rated the wine "Kellerei Kaltern Soll Sudtiroler Pinot Grigio, Alto Adige, Italy" the vintage 2003 on 15.06.2005 with 88 of 100 points. "Wine Enthusiast" has rated the wine "Kellerei Kaltern Soll Sudtiroler Pinot Grigio, Alto Adige, Italy" the vintage 2011 with 90 of 100 points.